Well, hello 2013! I can’t believe January is already here. It’s seems like just yesterday I was enjoying that decadent Crack Pie with Speculoos at Thanksgiving. December was a crazy whirlwind of a month (isn’t it always? ), filled with the typical gluttony that comes with the holiday season. Although I enjoy me some holiday gluttony, Asheley and I are now trying to recalibrate our systems a bit and start off this New Year with a little kind-of food cleanse. We are on Day 7 out of 10 as of right now. And I’m not going to lie, it’s been tough. Although we can eat unlimited fruits, veggies, legumes, and whole grains, there is no meat, dairy, or bread allowed. It’s really showing us how much we are addicted to those foods (Asheley is currently in withdrawal, desperately wanting to dig into the box of Trader Joe’s dark chocolate stars we have stashed away under our coffee table). I’ve had fun the last couple of days trying to find recipes and think of ways to still eat delicious food, even with all these restrictions. 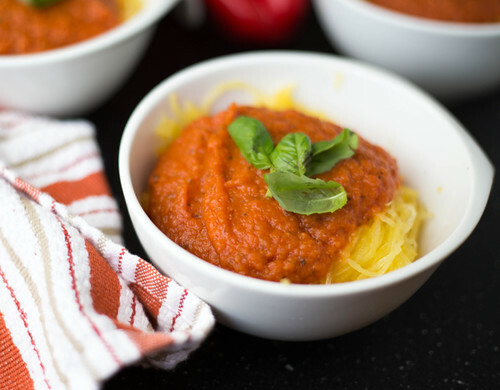 I came across and slightly adapted this delicious recipe for spaghetti squash from a really awesome food blog I just recently discovered: Two Peas and Their Pod. Although I still miss my no-good-for-me regular old pasta, this spaghetti squash made for a really healthy and deliciously flavorful meal. Elise, our good friend and Asheley’s maid-of-honor, was just over today and I made this spaghetti squash for all of us. She is a bit of a health nut and this recipe was right up her alley. She absolutely loved it, and I think you will too. Here’s how you do it. 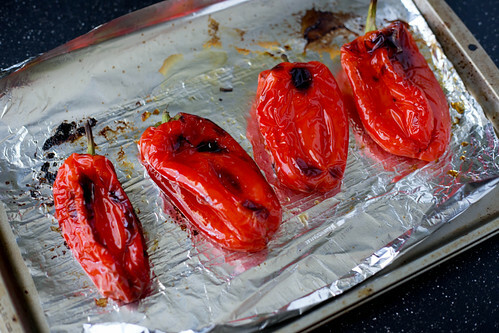 Start off by roasting some red bell peppers… three large or four small peppers will work. Brush the peppers with a little bit of olive oil and place in the oven with the broiler on low. Watch before your eyes as the pepper skins begin to char with blackened spots. Rotate the peppers with a pair of tongs until the peppers show signs of charring all over, about 10 – 15 minutes. 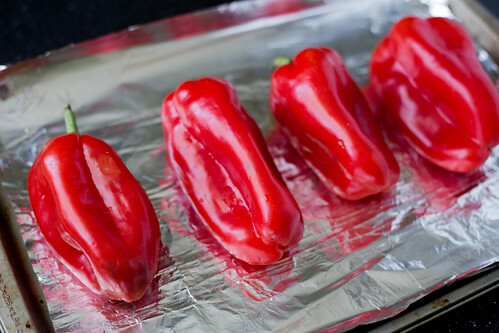 Remove the peppers from the oven and place in a bowl, covered with plastic wrap. The peppers will steam and the skins will loosen. 10 minutes later, remove the skins and seeds from your roasted peppers. Give them a rough chop. Meanwhile, you can start on the sauce. Heat about a tablespoon of olive oil on medium heat. Add in a diced large red onion, season with Kosher salt and a pinch of red pepper flakes, and sauté until softened and beginning to caramelize, about 5-7 minutes. Add in 3 cloves of minced garlic and cook for about another minute. Add in the chopped roasted peppers and a 28-ounce can of diced tomatoes, along with a 1/2 teaspoon each of dried oregano and basil. Season with some Kosher salt and freshly ground black pepper, and simmer for around 15 minutes. Let the sauce cool a bit, then pour into a food processor or blender, add a splash of sherry vinegar, and purée until smooth. The original recipe calls for greek yogurt, not sherry vinegar, but dairy is a no-no on our current cleanse. The splash of vinegar added a little more acidity and depth of flavor to the sauce which was really welcomed, but feel free to make yours creamy with some plain greek yogurt instead. Return to the pan and keep the sauce warm over low heat until your spaghetti squash is ready. 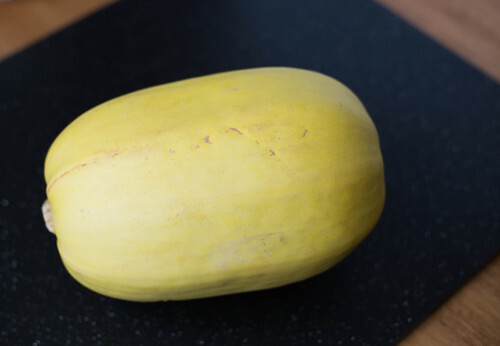 Speaking of… meet Spaghetti Squash. Once the red peppers were done roasting in the oven, you can start on the squash. It’s really a piece of cake to prepare. Cut it in half using a sharp knife (it’s kind of a pain to cut in half), and using a spoon or ice cream scoop, remove the seeds and other stringy guts. Take your fork to it and scrape a little of the flesh. If the strands come off easily, it’s done (give it a little more cooking time if not). Let the cooked spaghetti squash cool for about 5 minutes, then scrape all the flesh into a beautiful pile of spaghetti strands. Taste and season with some more Kosher salt and pepper if needed. When ready to serve, I would definitely top with a little fresh basil. It really made the dish sing. Spaghetti that’s actually good for you. Who knew?! Place red bell peppers on a baking sheet and brush with 1 tablespoon of olive oil. Put in oven under broiler on low. Roast for about 10 – 15 minutes, turning occasionally, until peppers are charred all over. Remove from oven and place in a bowl covered with plastic wrap for at least 10 minutes. This will loosen the skins, making peeling the peppers a lot easier. Peel the peppers, remove seeds, and chop. Preheat oven to 400°F. 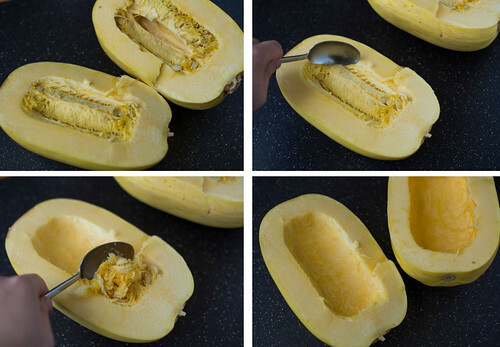 Cut your spaghetti squash in half with a large, sharp knife. Remove seeds and stringy guts, and brush the cut sides of the squash with 1 tablespoon of olive oil. Season with Kosher salt and freshly ground black pepper. 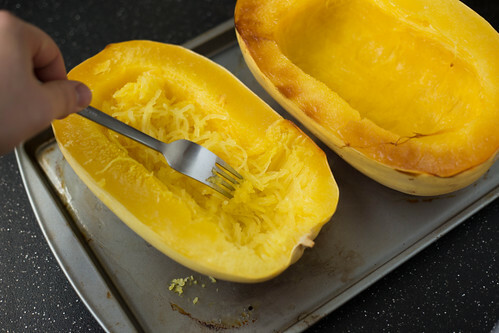 Place spaghetti squash, cut side down, on a baking sheet and roast until tender, about 45-60 minutes. Meanwhile, in a large saucepan, heat 1 tablespoon of olive oil over medium heat. Add onion and sauté until softened and slightly caramelized, about 5-7 minutes. Season with Kosher salt and a pinch of red pepper flakes. Add the garlic and cook for about 1 minute, stirring occasionally. Add in chopped roasted peppers, can of diced tomatoes, oregano, and basil. Season with Kosher salt and freshly ground black pepper. Simmer for about 10 minutes. Let cool a bit, then pour into a food processor or blender. Add a splash of sherry vinegar and purée until smooth. Taste and see if it needs more Kosher salt or sherry vinegar. 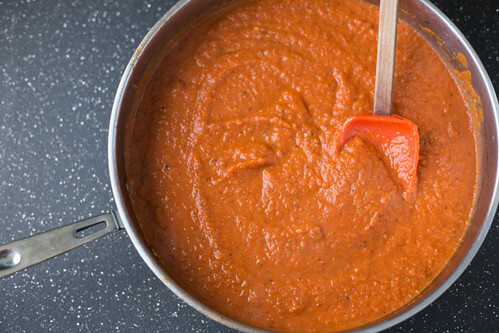 Once you are happy with the sauce, return it to the pan, and keep warm over low heat until ready to serve. 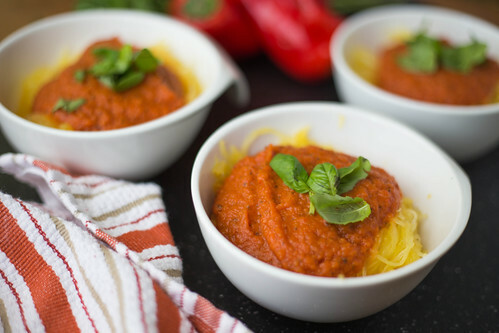 When ready to serve: place roasted spaghetti squash strands in bowls and top with Roasted Red Pepper – Tomato Sauce. Garnish with some fresh basil, which although optional, I highly recommend. Hey Chris, I love reading this website! Such great ideas! 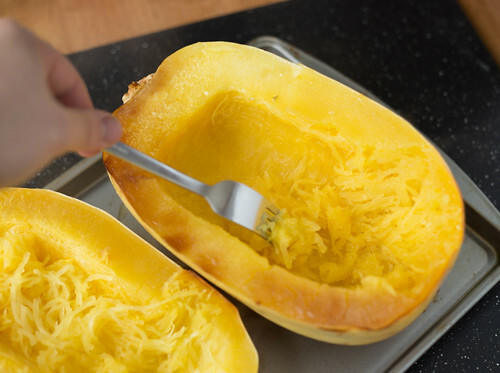 I am going to try this one out since Mara and I love spaghetti squash! I’ll let you know how it comes out. Great to hear from you Anthony! Thank you so much for your kind words, you made my day 🙂 So excited that you are going to try it! How else have you had spaghetti squash prepared? I’m interested in trying out different ways. Been looking for a wheat and gluten-free pasta recipe that is healthy and delicious. Well, seems as if I’ve found a substitute that can rival the original in taste and flavor complexity. The peppers and vinegar give it that zip you love if you’re like me with all the ingredients that your nona used. All that flavor paired with nutritional values that would put a smile on any dietician’s face. Bravo! Ridiculous flavor!! I’ve never had spaghetti squash before this. My husband has a gormet palate and his was doing cartwheels while eating this. I’m Italian and very picky with my sauce and this was incredible. Can’t wait to try the squash with broccoli, olive oil and garlic!! Thank you Chris for introducing me to spaghetti squash!!! so glad you enjoyed it! Glad it stood up to the Italian standard! Fantastic! Almost thought it wasn’t worth it after struggling to cut open the spaghetti squash, but I’m glad it turned out. Next – spaghetti squash pad thai! Hi Lee, yes I know exactly what you mean with cutting open the squash! It’s a bit of a hassle, but once you wrestle it to the ground and cut it open, the reward is great! Awesome, let me know how the pad thai turns out!